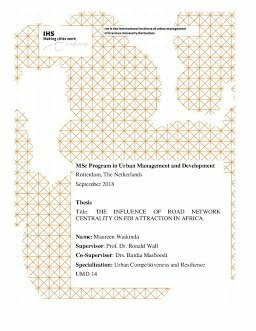 Erasmus University Thesis Repository: The influence of road network centrality on FDI attraction in Africa. The influence of road network centrality on FDI attraction in Africa. Issues concerning infrastructure development have for long been of interest to policymakers across the globe. Africa is the least connected continent globally and the infrastructure gap is a major structural constraint to the full exploration of economic opportunities within the continent. A major hindrance to infrastructure development in Africa is the finances needed to fill the infrastructure gap. AIDA, PIDA, ICA and AfDB estimate that the continent requires approximately over 90billion US$ annually for the next 2 decades. By facts, this gap is so high that individual state budgets cannot sole-handedly meet this demand. Private investments are still insufficient. All major institutions backed by research have shown the implications of a disjointed unconnected continent on economic development and regional integration. For instance, the cost of trading becomes 70% higher in land-locked countries due to a lack of opening up of these regions. About 70% goes to the cost of transport on the price of a commodity (Bond, 2016). A view into African Union’s agenda 2063 for Africa; a key priority is to create a prosperous and integrated continent. Infrastructure development is considered as a bridge to achieving most of the strategies aimed at achieving integration. Achieving infrastructural development and increased connectivity in the continent is not only a major aspiration for the African Union but also very important and central in achieving the Agenda 2030-sustainable development goals. The SDG target 9.1 calls for developing sustainable infrastructure that facilitates regional and cross-border integration for increased economic development and the well-being of humans. In 2013, the Africa Infrastructure Country Diagnostic results indicated that approximately 50% of the recent economic developments in Africa were accounted for by investments into infrastructure. Therefore, the importance of developing infrastructure cannot be understated. Empirical studies on the effect of transport development on economic activities in the continent are important. Most studies previously done have majorly examined aspects of infrastructure quality and quantity. This research seeks to establish the level of influence that road network centrality has on foreign investment activity in Africa. Road network centralities help to show the level of utility of the road network and can predict future possible connections that once physically linked can have significant impact on the competitiveness of cities in Africa. Using this knowledge, African states can collaborate in order to leverage their resources and help to minimize costs when it comes to seeking out investment options for infrastructure development.